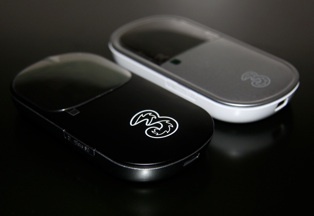 Every now and then there are sequels that are better than the originals, Empire Strikes back, and Terminator 2 and the best examples I can think of quickly, but now I have to also add to that list the latest version of the Mifi Device from Three, Mifi V2. Thanks to the people at Three, I have had this device for a little while and I am very impressed. I really liked the first edition of the device, you can read that review here, but this model is a big improvement. The make and model of the device is the Huawei E585, it is very similar in size to the first model, as you can see from the picture. 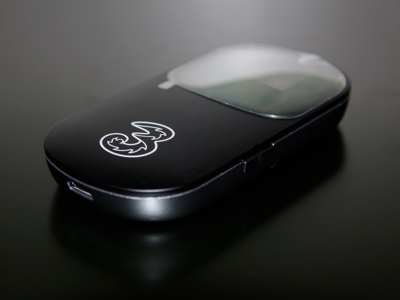 It is a 3G modem that allows (signal permitting) a HSDPA connection so you can achieve good download speeds, it also acts as your own portable wifi hotspot. It is advertised as allowing up to 5 pieces of your tech to connect to the device to all share the connection, and from all my testing this has been the case. The new design is greatly improved over the first model, now instead of the symbols changing colour as to signal strength, battery time etc, you now have a small OLED screen which clearly shows all of the information required. 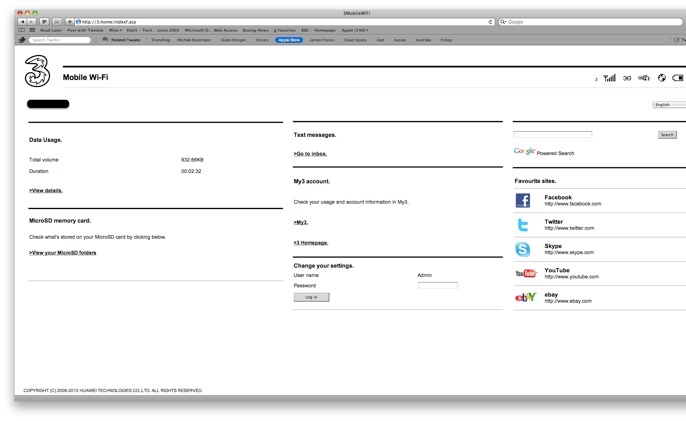 The display shows the following, (This picture is from the Web dashboard, but its the same on the device). Another good enhancement, is it now shows a counter of how much data the device has transferred and how long the device has been used for since you have switched it on for the day. The biggest improvement, that I think, is now you only need to have one button to switch the device on and connect to the internet, before with the first edition there could be a combination of either two or three buttons to get the device fully activated, but now with this device, you just switch it on and it activates everything automatically, so this does make using the device easier, you can just switch it on then drop it back into your bag or pocket. Also now with the E585 you can still use the device while it is charging up, so whenever the device is running low you know you can connect to any machine via usb to charge the device or plug it in and you can carry on working. One of the main issues I had before about the device was the fact that if you needed to connect to the management software you could only access it by connecting the mifi to a windows machine ONLY. Thankfully this has now been rectified and you can access the software from any OS using a browser, if you navigate to http://3.home you can now you can edit any configuration from any browser. After the first visit add a simple bookmark so one click I can access the software, you can see more pictures from the dashboard at the bottom of the post. You can also now use the Micro SD slot that is on the device, so you could use this as a portable drive to carry around files with you etc, although to be honest I can’t see myself using that feature. I personally always have mine with me, I always use this with my iPad, it was because I had the original mifi why I did not get the 3G iPad. The good thing about having the device on is that whenever I am working on notes, posts reviews etc, I always use Evernote and Dropbox, so I know that every time I can make a small edit I know it will be automatically backed up for me, if I am on the train or out of the office, I don't have to think that I need to sync up later to save my document. IMPORTANT - I am offering you a chance to win your own Mifi and a SIM with 12Gb of Data, click here to enter the competition.